Q. Can we order less than 100 cookbooks? A. YES! You can order as few as 5 books - 10 books - 100 books - 1000 books. It's up to you. Just keep in mind that pricing is based on the number of recipes and the number of books. The more books you order - the better the price. Q. Can a smaller group do a fundraising cookbook or does it have to be a larger organization? A. Absolutely! Even a group with a few members can produce a cookbook and sell it successfully as a fundraiser. Q. How long does it take to have a book made - from start to finish? A. With Online Recipe Submission, from the time we receive your recipes until we ship your completed books is about 4 weeks. This also depends upon how quickly you review the final proof of your book as changes can/will cause delays. Gateway Rasmussen does have one of the fastest turnarounds in the industry at 4 weeks. Q. When should I expect to see a proof of my book? A. You will receive a proof of your cookbook in approximately 7 to 10 business days. Q. Do recipes have to be typed? A. 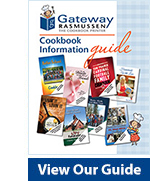 If you are using Gateway Rasmussen's Online Recipe Submission - submitting recipes is done online. If you are using the Recipe Submission Forms - they do not have to be typed but printed legibly in ink. One recipe per form. Q. Can we design our own cover and how much will it cost? A. Absolutely. We encourage you to personalize your cookbook and what better way than to use your own image on the cover! Photos must be supplied electronically and should be a high resolution (300 dpi). There is NO ADDITIONAL CHARGE for our design team to give you a hand in setting it up your FREE full color cover. Q. If we use one of your Stock Cover / Divider Sets can we change the wording on the cover? On the dividers? A. All of our Stock Covers allow you to put the wording of your choice on the front cover. Our Place Settings Divider Set is designed for you to put your own titles at no additional charge. Q. How much does it cost for shipping the books to us? A. Gateway Rasmussen prepays Ground UPS freight charges on all cookbook orders in the continental United States and Canada and then we add those charges to your invoice. Gateway Rasmussen will then ship 3 extra books for every 100 books ordered FREE with your order so that you can sell them to offset the shipping cost. Q. What are the payment terms? A. We offer flexible payment terms. Recognized non-profit organizations can remit one-half of the balance due 30 days after the books are shipped. The remaining balance is then due 60 days after shipment. For private individuals, families and businesses, a 50% deposit is required with the balance due when the books are ready to ship. Q. Can we include recipes that we get from magazines or the Internet? A. Yes but there are some exceptions. Recipes themselves cannot be copyrighted but certain recipes have trademark titles (ie. Neiman Marcus® Cookies) and should not be duplicated. Reproduction of an entire cookbook may also be considered infringement. Artwork taken from greeting cards, scrapbook paper, books, etc. is copyrighted. Unless you are able to obtain written permission to use these images, it is recommended not to. Q. Can we print our organization's logo or a business logo in my cookbook? A. Logos are trademarked. You should get permission to use any logos in your book. Contact us for an Image Release Form for your organization or business to provide you with authorization.